The Virility Paradox: The Vast Influence of Testosterone on Our Bodies, Minds, and the World We Live In. 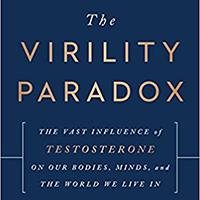 A new book titled: The Virility Paradox: The Vast Influence of Testosterone on Our Bodies, Minds, and the World We Live In, is out this month, by Charles J Ryan. Ryan is a Professor of Medicine in the Division of Hematology / Oncology at the Helen Diller Family Comprehensive Cancer Center at the University of California, San Francisco (UCSF). “Testosterone makes us stronger, happier, and smarter. It also makes us meaner, more violent and more selfish. A scientific look into the vast and unexpected influence testosterone has on our behavior, our society, and our bodies. “The brain of every man—and every woman—is shaped by this tiny molecule from before birth: it propels our drive for exploration and risk, for competition and creation, and even our survival. The effects of testosterone permeate the traditions, philosophy, and literature of every known culture—without it, the world would be a drastically different place. “Testosterone also has a role in humanity’s darker side, contributing to violence, hubris, poverty, crime, and selfishness. Recent revelations of the science of testosterone show that high levels will deplete compassion and generosity, and even reduce the affection we show our children. “In The Virility Paradox, internationally renowned oncologist and prostate cancer researcher Charles Ryan explores this complex chemical system responsible for a diverse spectrum of human behaviors and health in both men and women. Ryan taps his vast experience treating prostate cancer with testosterone-lowering therapy, observing that this often leads to profound changes in the patients’ perspectives on their lives and relationships. Often, for the better. “Ryan uses the journeys of these patients and others to illustrate the vast and sometimes unexpected influence testosterone has on human lives. Through the stories of real men and women, he also explores the connections between testosterone and conditions like dementia, autism, and cancer, as well as the biological underpinnings of sexual assault and the effects it has on everything from crime to investing to everyday choices we make.